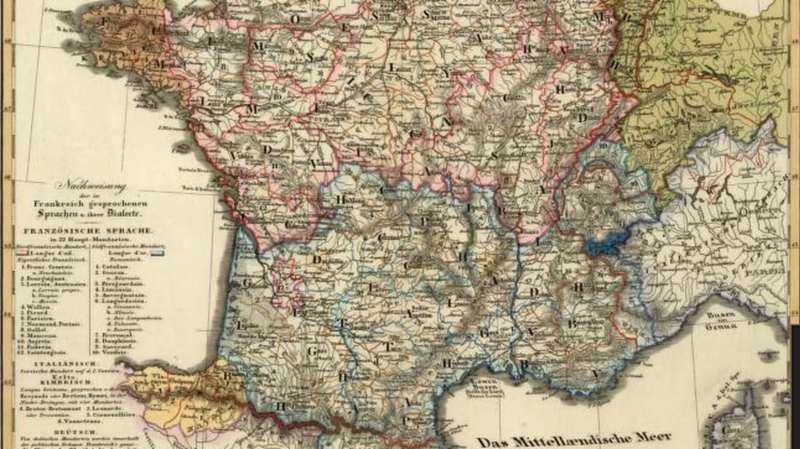 Until the 20th century, there was a great deal of linguistic diversity in France. In the north were the langues d’oïl, and in the south the langues d’oc, so-named for the difference in the word for yes between the two groups in medieval times. (Modern standard French's oui comes from oïl.) Within those two groups there were a number of dialects, sometimes with so little in common they could not be mutually understood. 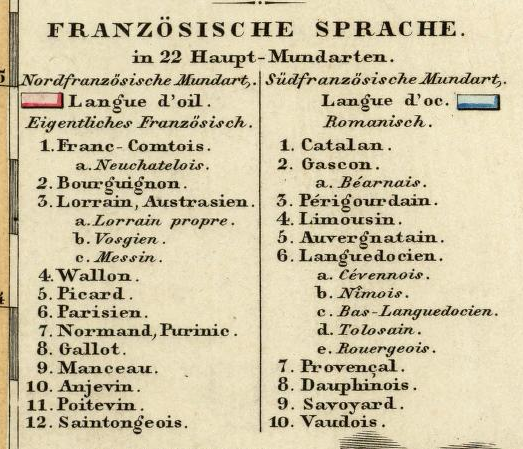 The key lists the 22 main dialects of French. There were also languages that were from different language families entirely: There were Celtic languages (Breton), Germanic languages (Alsatian), languages with no known relatives (Basque), and a language closer to Italian (Corsican). They also had subdialects, as shown in this key. Some of these are still spoken in France today, but by very few people. After compulsory education began in the late 19th century, the Parisian dialect of the langue d’oïl became widespread. It already had special status, but because most people had no need to converse in legal or official contexts, they didn’t bother to learn it. 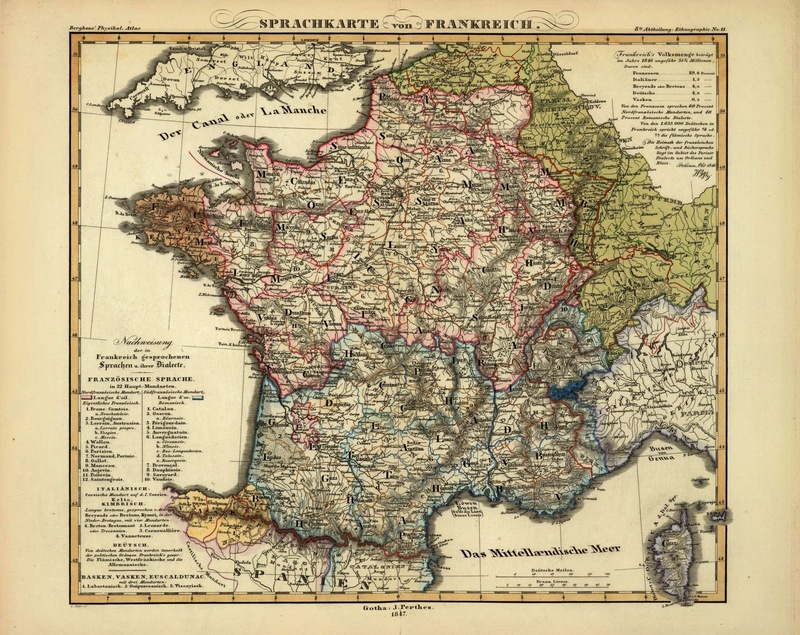 A 1790 study found that only 10 percent of the population of France spoke standard French. 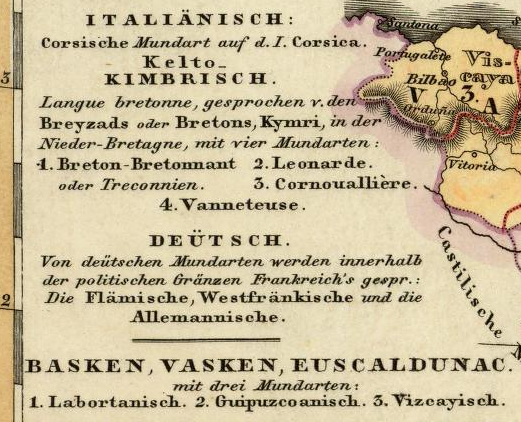 This map was made in 1847, before French had truly become the language of the whole of France. The oïl languages are outlined in pink, the oc languages in blue. The rust brown in the northeast is Celtic, the green, Germanic, and the yellow, Basque. Explore the zoomable map at The David Rumsey Map Collection.